On your arrival at Cochin Airport, our driver will meet you near the exit area. He will drive you to Munnar that takes about 4 hours. Rise to a beautiful fresh morning and breathe in the pure unpolluted air. Enjoy your morning breakfast. Today we spend the day for local sightseeing. Situated at the confluence of three mountain streams - Mudrapuzha, Nallathanni and Kundale, Munnar is 1,600 meters above sea level. Earlier Munnar was the summer resort of British government in South India. On our sightseeing tour, we visit Mattupetty Dam, Kundale Lake and Echo point. In the afternoon we proceed to Rajamalai. There is a possibility for you to spot ‘Nilgiri Thars’ here, the rarest species of mountain goat. Enjoy your evening in the romantic surroundings. Stay overnight at hotel in Munnar. 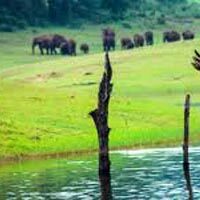 After having morning breakfast, check out from the hotel and proceed to Thekkady, the famous wildlife sanctuary of South India. Check in at the hotel upon arrival and relax. Today visit to Spice Village & in the evening, enjoy a refreshing boat safari in the spectacular Periyar Lake. Take your camera along to capture the glances of some rare varieties of birds & animals at Periyar National park. It is a home to nomadic tribes of wild elephant, boar, deer, the great Indian tiger and many more. Later return back to Hotel. Stay overnight at hotel in Thekkady. One of the major attractions of Kerala that pulls in numerous tourists to the destination, BACKWATER is a unique attraction. Check in to your houseboat. Relax over the gentle ripples of calm waters and sights of palm groves swaying in the cool breeze, away from the city dust and screeching honks; a silent charm that makes it no less than a paradise. Relish freshly prepared lunch on the houseboat. The day is at your own to accustom with the place. Spend a beautiful night by the dim moonlight, by the hushing waters and cool breeze. After having dinner on board, enjoy ultimate intimacy with nature and oneself. Rise to a wavy morning in the houseboat over the backwaters. Enjoy morning breakfast sitting by the passing coconut trees and sparkling backwaters. Later check out from the houseboat and transfer to Kovalam. Check in and relax in the hotel. You will be free in the evening. You will Transferred back to Airport / Railway Station.